Church Connection Cards is rated 5.0 out of 5 by 10. 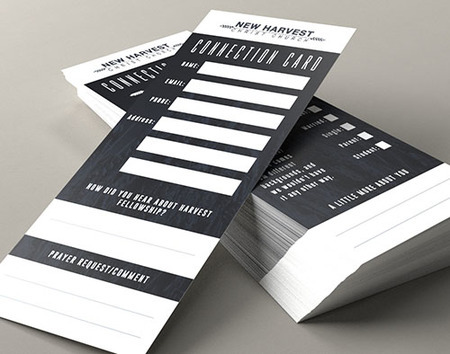 Connection or welcome cards provide your church with a tool to connect with both members and visitors. Rated 5 out of 5 by mgrad73 from Connection Card I bought these to give a more professional appearance to our welcome literature at church. I have achieved that objective. Rated 5 out of 5 by Rachel from Quality Product The connect card turned out great. The customer service team was awesome in helping me make sure our product was exactly what we wanted. I had an issue with the bottom and they talked me through how to fix it and make it perfect. Would definitely recommend. Connection cards can be sized to fit in standard pew racks, or you may include yours in bulletins or other handouts for guests or members. They can be used to keep track of prayer requests or new member information. Print connection cards to fit your church’s needs with our custom options. In a hurry? Custom connection cards will ship the same business day for jobs with "same day printing" selected and sent to press by Noon CT.
Use our postcard layout templates to ensure your artwork meets requirements for printing. Free layout templates are provided in EPS, JPG, PDF, and Publisher formats for front and back side printing. If your postcard is mailing, be sure to check the mailing requirements for mail panel design requirements. Connection cards are a useful tool to help members and visitors give information or prayer requests to your church. Our standard sizes fit most pew racks plus you have the option to select custom trim to fit your exact size requirements. Connection cards or visitor cards can also be included as bulletin inserts.